grew up at 3850 Sedgwick Avenue. My apartment was on the fifth floor and our terracefaced the Jerome Park Reservoir and the handball courts of "Pigeon Park". From the time I was an infant until I was 18 years old, going to that park, weather permitting, was done almost on a daily basis. My family lived about a block or two from the park so it was a nice walk, or bike ride, or roller skating trip to the park. 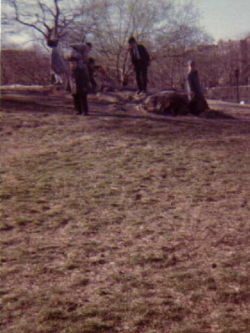 The park was a place where children's moms would sit and chat, play cards or mah- jong, a place where the men would read their newspapers and discuss politics, and the kids would run and play. It had swings, one set for the little kids and one set for the older kids, monkey bars, slides and a sandbox. In the back of the park there stood basketball courts and handball courts that were always full of activity. The summer months were the absolute best. If it got really hot out, the "parkie" would put the sprinklers on and all the kids would play and run in it all day. Once word got out the sprinklers were on, the park became very crowded. The large shade trees that seemed to touch the sky, would help keep us cool too. We always had a choice of which ice cream truck to pick…Good Humor, Mr. Softee, Bungalow Bar or Uncle John's. Sometimes three trucks would pull up at once – talk about a confused kid! During the Jewish Holidays, the park was buzzing more than usual. It seems the entire neighborhood, people from the Shalom Alechaim apartments, all the way down to Van Cortlandt Park, ventured out of their apartments to take a walk through the park, where they would visit and chat with friends and neighbors. Everyone was always so nicely dressed up on the holidays. The men wore their dress hats and the women wore white gloves and high heels. I remember the older people sitting on the benches facing the reservoir and sunning themselves. A lot of these people were Holocaust victims as you could easily see their identification numbers tattooed on their arms. The park got its nick-name "Pigeon Park" and was referred to as that (instead of its actual name, Fort Independence Park) because of the large group of pigeons that would flock there to feast on stale bread the neighbors would feed them. I learned how to build a sand castle in the sandbox, make mudpies, how to play hopscotch, hit the penny, knock-hockey, handball, potsie, and jump rope. My father taught me how to ride a two-wheel bicycle in the park, but not without incident however. I did hit a few park benches here and there and still have the scars on my knees and elbows. In the winter I learned how to sleigh ride and eventually I got big enough to sleigh down the big hill in the back of the park. I learned how to roller skate, and also learned that you never lost your skate key, which you wore around your neck as if it were a valued piece of jewelry. As teenagers we became one big group who always hung out in the park. It was "our park". Of course, we would always venture down to Em's Candy Store for our egg cream, burger and pizza fix. The park was a place you could go to, and always find someone there you knew. When we were older, we used to sit on the hill under the trees and listen to rock-n-roll music, watch the older boys play basketball or touch football. On warm summer nights we would get together and play cards, have a few beers, and just hang out, talking and laughing and just being carefree teenagers. I remember my first kiss in the park. And having your boyfriend carve his and your name in the park bench. That was a total status symbol! The neighborhood was "family" back then. We shared this one place that always seemed warm and sunny. It was our little piece of the country in the city. A tree lined park filled with birds, squirrels, hills, sunshine and laughter. A place to run to. The park. How many beautiful sunsets I've seen as the sun set over the water in the Reservoir and how the water glistened and sparkled like diamonds. The park, where many friendships were made and many lessons learned. A place that gave us beautiful memories that will never ever leave our hearts. Even though our footsteps may not touch the park grounds today, or our shadows fall upon the sidewalks, our spirits linger there and our love and laughter remain. It will always be "our park".